FEATURES Highest degree of accuracy when used at a temperature of 68°F (20°C). Each block serialized, regardless of the grade, for identification when block is re-calibrated and certified at a later date. Alloy steel with Rockwell hardness of 65. 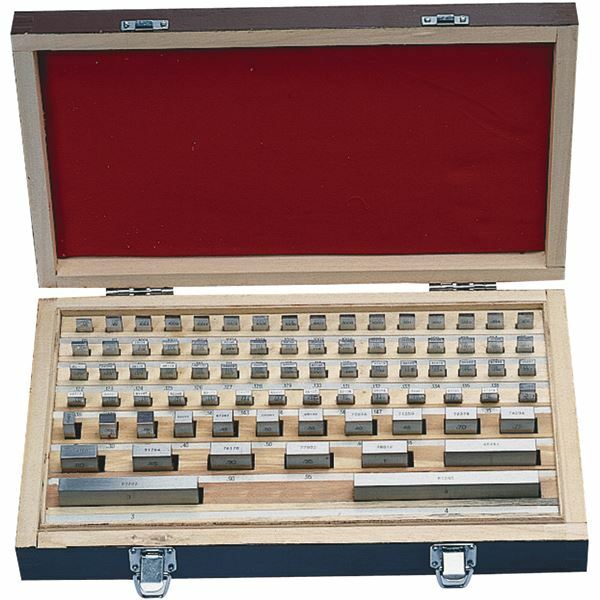 Sets are calibrated to meet or exceed federal specifications GGG-G-15C. Grade "B" Supplied with a certificate of accuracy only. INCLUDES (9) Blocks: .1001" to .1009" (.0001" steps), (49) Blocks: .101" to .149 (.001" steps), (19) Blocks: .05" to .95" (.05" steps), (1) Each of blocks: 1", 2", 3", 4"